Day two of Pistorius sentencing Jump to media player Oscar Pistorius has been in court for a second day of sentencing arguments over whether he should face prison for killing his girlfriend. 'No facilities' for Pistorius in prison Jump to media player A probation officer has told the sentencing hearing in the Oscar Pistorius case that there are not appropriate facilities in jail for the athlete. Pistorius 'community service' row Jump to media player South African athlete Oscar Pistorius should not go to jail over the killing of his girlfriend, Reeva Steenkamp, a court has been told. Pistorius 'community service' row Jump to media player A defence call for Oscar Pistorius to carry out community service for killing girlfriend, Reeva Steenkamp, sparks an angry prosecution response. Pistorius on trial: Behind the scenes Jump to media player A look behind the scenes of BBC News' coverage of the Oscar Pistorius trial in South Africa. 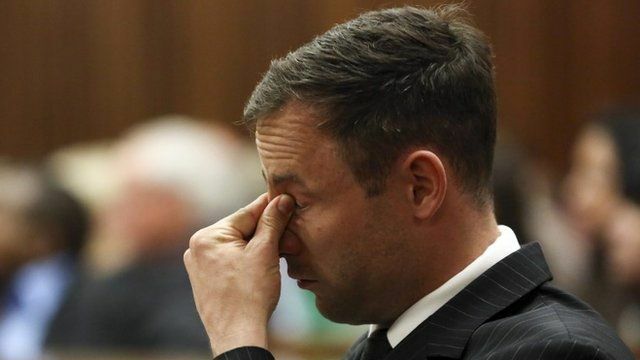 Pistorius guilty of culpable homicide Jump to media player The judge in the trial of Oscar Pistorius has announced the South African athlete is guilty of culpable homicide. Oscar Pistorius has been in court for a second day of sentencing arguments over whether he should face prison for killing his girlfriend. A defence witness told the court that, as a double amputee, Mr Pistorius would be at risk of attack in South Africa's violent jails. Mr Pistorius's manager, another defence witness, has described Mr Pistorius's charitable work and his record as a role model for disabled youth.